Here is an essay version of my class notes from Class 15 of Stanford University’s CS183C — Technology-enabled Blitzscaling — taught by Reid Hoffman, John Lilly, Chris Yeh, and Allen Blue. Errors and omissions are my own. Credit for good stuff is Reid, John, Chris Yeh, and Allen’s entirely. 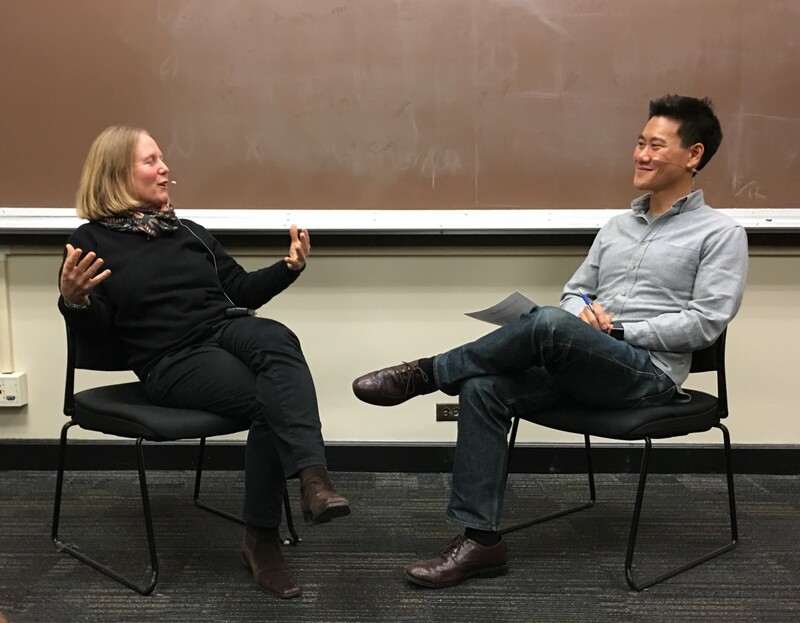 This class was an interview by Jerry Chen (partner at Greylock who used to work at VMware) of Diane Greene — the founder and former CEO of VMware — on lessons learned from scaling VMware. Jerry Chen: During the period VMware was scaling we were doubling in headcount every year, if not every quarter, how did you keep the culture strong while you scaled? Diane Greene: It’s counterintuitive but it was more difficult to hire in the beginning. When we were small, the idea of VMware wasn’t well defined and convincing people to join was difficult. Each person we hired at that time was a big deal. When we were bigger, our #1 competitor for talent was Google — which is interesting given that now I am on the board of directors for Google. In fact, Larry and Sergei said one of the reasons why they asked me to join the board of Google was because they had lost people to VMware, one of the few companies this happened with. Our main pitch to candidates was, if you wanted a 24/7 experience at work — you should join Google. If you had a hobby, family, or wanted to do things besides work — you should join VMware. We didn’t have nearly as long hours as Google given our customers worked normal business hours. Jerry Chen: I’ve heard you say as an organization you should either be great at hiring, great at firing, or both — to create an auto-immune system — can you talk about this? Diane Greene: Once you have a critical mass of good people — if you bring someone who isn’t a fit, they self select to leave. We had to watch really carefully to see if people were a fit or not and then help them leave if they weren’t the right person. Jerry Chen: While you are scaling, how do you think about hiring from the outside vs. promoting from within? Diane Greene: When we hired for the first of something, we would typically go outside to find talent. One caveat is we didn’t normally hire for the VP or senior type of person, instead we looked for exceptional individuals. For example Jason Martin was a smart Stanford grad we met who had run the track team. He came in as an individual contributor to our new professional services team and he was so driven he ended up running the entire division. He took the professional services group from 3 people to 450 people and grew revenue in that division to $150M+. In fact we thought we would have to run the whole professional services division as a cash neutral division but Jason said no way, and he ran it as an revenue generating division. Jerry Chen: I remember a time when VMware could fit in one lunch room and it was easy to tell everyone what happened each week. This communication is great, but gets more difficult as you scale — how do you maintain communication at 1,000+ people? Diane Greene: When I first started VMware I was very shy and self conscious about speaking. I grew out of this by giving talks each week in front of the whole company, gradually as we scaled, I had talked to more and more people and this is how I conquered my fear of talking to people. When we got bigger we sent out emails to everyone. We first started with our Monday staff meetings — we would do a writeup of what was going on in our group — particularly things other groups should know about. Question from the audience: Do you do the same thing in the startup you are working on now, or do you do communication differently? Diane Greene: In the startup I am building now, the company has a lot of very different kinds of people. For example we now have designers who are challenging for me to work with — I had never worked with many designers before and I have a lot of respect for what they do — I wish I could do what they do, I am at their mercy (haha). We do the same reporting structure as we did at VMware but the difference is these reports aren’t helpful in running the company (given we are so small) but they are helpful in getting everyone to understand how to communicate with one another. These reports help everyone to speak the same language and talk in the same way. As we have gotten bigger and brought on new people — now I can just send them to read all of the reports and they can see exactly what is going on. New business tools such as Slack are making things like this easier. Jerry Chen: Going to the product side — VMware started off by selling workstations then moved to packaged software — how do you know when to add new product lines? Question from audience: For the people who aren’t familiar can you explain what virtualization and VMware is and what it does? Diane Greene: Virtualization is a layer of software that sits between the hardware and software stack — but masquerades as hardware. What this allows you to do is run multiple “virtual machines” on top of one machine (this is called a Hypervisor). You could run any type of operating system you want on any type of machine that you want — aka OSX and Windows on the same machine, DOS and windows 95 on the same machine, Linux and Microsoft together, etc. In terms of servers, virtualization solved a lot of scalability problem. Servers which were vastly underutilized could be put to use by having multiple virtual machines on top of a single server. This maximized the utilization of each server. Going back to Jerry’s question, the vision of VMware was always to build the full server product. Our challenge was no customer was ever going to remove their own operating system and put our hypervisor on their servers to start with — how could we test out this concept? At the same time Linux was just starting to take off. What we did is built a tool to allow developers to run Microsoft tools on Linux. Next we built this for the desktop to allow people to run any operating system they wanted with Linux underneath. Everyone thought we were smart because Linux became this huge deal but we were lucky. Jerry Chen: You could have gotten stuck on Windows for Linux — when did you know when to revisit the original strategy? Diane Greene: We were building both products from day one. Our desktop business did very well, we got up to $100M in revenue. In fact initially we thought we would have to give our tool away for free because Linux users were used to everything being free and open source. Michael Dell was quoted in CNN at the time saying he was investing in a lot of Linux based companies because he wanted to level the playing field with Microsoft — but he would lose money on all of these investments. Can you believe how much money he is spending on VMware now? For VMware we were cash flow positive from day one and we ran to company to be break even. When we first launched our server product (ESX server) nothing happened and no one bought it. What we did next was to take our existing desktop product, renamed it to be a server product (GSX server), put it into our preferred vendor program, and then relaunched it. This is the product that took off and no one noticed we had launched it again. Jerry Chen: VMware was the fastest growing enterprise software company in history (at that time) and heavily used key channel partners for sales (IBM, HP, Dell, server companies) — how did you stay neutral with all of these partners? Diane Greene: We tried and used every channel possible — resellers, VAR’s, direct sales, but our focus was on the hardware vendors. Our standpoint for partners was — we were going to be Switzerland. I haven’t seen this in many other companies — with partners I see companies give up exclusive rights, preferred pricing, etc. For VMware, we said we need to be able to run on all platforms — we didn’t know what hardware people would use in the future so we had to make sure we could work across everything. Our top priority was our customers, then our partners, then ourselves. We used this algorithm for all of the decisions we make. We would treat them all the same. We promised not to tell other accounts people signed up (aka if a VMware sales person worked with an HP and a Dell customer — they wouldn’t share info about the sale across companies). If a partner developed something proprietary on top of VMware — we would keep it proprietary. If VMware developed something new, they would share it with all partners. Over time they wrote down all of these rules of engagement and made these rules very clear. If anyone in VMware violated these rules, they were fired (this happened). Our partners argued with us but in the end they liked this arrangement because they could trust us. This strategy worked because our partners were a huge channel for VMware. Question from the audience: Why did your partners care about sharing customer info across accounts? Diane Greene: If someone knew a customer was in the market to buy virtualization — that customer ended up buying a lot of additional hardware. These partners wanted to sell hardware to these customers so we didn’t share that info across partners. Jerry Chen: One of the big strategies for the partners was, for every one dollar of $1 of VMware a customer spent — there would be $8 of add on hardware and services. This amount rose to $12-$14 for each dollar, and these were hugely profitable partnerships for each of the hardware companies. Let’s talk about the sales organization. In an early stage enterprise company, sales is seen as an expense until they ramp up — when do you know to pour on the gas and ramp up sales? Diane Greene: Sales was a new territory for me. When we first started hiring sales people — I didn’t know what good sales people looked like. We hired many different kinds of sales people and paid close attention to the results of each person. What also makes this challenging in the early stages is it’s tough to figure out if they were bad sales people or if the product wasn’t right. I personally had to go out and study sales and talk to every VP of sales I could find. The culmination of all of our learnings turned into a sales model which we now teach at Stanford. These three people made up one sales team — and we would give each team a goal to hit collectively. One caveat is each team member didn’t necessarily make the same amount, typically the direct sales people would take more of the % than the sales engineer. The main principle was the compensation was tied to how the team did collectively, not by individual performance. The second thing we did which was unique was, if a salesperson made a sales through a partner — they would make the same commission as a direct sale — even though VMware didn’t make as much money on the transaction. The smart salespeople, instead of directly selling, went out to educate all of our channel partners. The sales people loved this because the best salespeople leveraged themselves in the best way and made millions of dollars for themselves. VMware in return love this because they made more money through their leveraged partnerships. Jerry Chen: There are two lessons. One the direct sales person and sales engineer are on the same team. Two, you developed a model to train your partners, giving VMware huge leverage in the long term. How do you think about compensation, not just for sales but for the other functions within the organization? Diane Greene: Compensation is different today from when I started VMware. It used to be only the Google’s/VMwares of the world could pay competitive compensation, and startups were significantly less. Now with all of the unicorns out there, you can actually make more money at a late stage startup. This never used to be the case. It’s much more competitive now. Jerry Chen: Moving back to the product side, how did you keep scaling up R&D and innovation as you hit 7,000 people? How did you foster an innovative culture? Diane Greene: One thing which was helpful was, we had exceptional people who were all very self driven. We looked for people who set the bar high for themselves and we expected this from the top engineers all the way down to the individual receptionists. A second thing we did for engineering was we would ask for the release schedules and we would intentionally put some extra time into the schedule. It was our philosophy to give people extra time for people to play around with the product before it was launched — we never scheduled to the max. A third thing we did is we had “poster sessions” which were conferences within VMware where any employee could write a proposal for how to improve VMware and present their proposal to the whole company. The top people would win a prize and be able to go and implement their proposal. We wanted to make it clear that if you were showing initiative — you weren’t going to get in trouble — in fact we liked and rewarded it. Question from the audience: How did you do the hiring for your current startup? Was it all through your personal network? Diane Greene: In the beginning, it was all from my personal network — keep in mind my startup is only 36 people now. We brought on 5 former VMware engineers and one former senior VP from VMware. One thing I learned in VMware was for areas I didn’t have expertise in — for example in Sales — I didn’t know what a good VP of Sales would look like so we would constantly rotate and upgrade our VP of Sales until we found the right one. In my startup I had the same problem with design. I personally had to read design books and start hanging out in coffee shops in the Mission District (haha). I asked everyone I knew who they thought great designers were and learned enough from them until we finally found our head of design — Sara Ortloff Khoury. Jerry Chen: Let’s talk about design. At VMware we built this great platform but never had a focus on design. How do you understand design and UX now differently from before? Diane Greene: The UX layer is a mess. We worked really hard on the lower lawyers — the database, the systems, how the backend talked to the other pieces, how updates works, etc. However not a lot of people have worked on the layer above this — especially around enterprise products. The ability to design really complex interfaces (access controls, user roles, security, etc) in a simple and easy way is tough. Question from the audience: When you thought about starting VMware, did you think about it as a platform that would transform to become the core decision making power in the enterprise stack? Diane Greene: It wasn’t at all premeditated. We did believe that VMware should run on every piece of hardware, and we did think of ourselves as a platform which is why we took this neutrality stance. What we found out was, VMware was useful even on a single server. An individual developer could try it out and it would spread virally throughout a company in tiny pockets. In fact we didn’t want to go to the decision maker right away (the CEO/exec type person) because we would have had to go through a purchasing agent. These purchasing people got compensated on how big of a discount they could get from vendors, so we tried to stay away from these people, especially in large enterprises. Question from the audience: What are your views on containers and the Docker revolution? I would say we couldn’t do containers at the time we started VMware. No one believed in virtualization so we had to be as non-disruptive as possible. Now that enterprises appreciate the value of virtualization, it’s possible to do lighter weight containers. Question from the audience: With VMware and your current startup, you stayed under the radar for a long time vs. other companies that go public quickly. What’s the benefit of staying under and over the radar? Diane Greene: The main advantage of being under the radar — is you set the pace. You can do this when you’re ready, you don’t have to deliver until the product is great, and it’s easier to build trust that way. For VMware given it was a product everyone was going to run on top of — we had to be trustworthy. Generally I think staying under the radar is less stressful and a nicer way to operate. If our engineers said we needed to change something — we could take the time to do it. This is somewhat a function of my own personal style as well. Other people like Marc Benioff can play the “over the radar” attention game very well. This just wasn’t me. However if you put Marc Benioff and me together…. maybe there would be something there. Jerry Chen: When did you know when it was time to upgrade the team? What were the signs you looked for? Diane Greene: It’s always different but I can give you a couple examples. Our first sales guy came to us when we were doing $10M in revenue and told us we would be lucky if we got up to $20M in revenue. This is a good sign it’s time for an upgrade, we knew we could get more than $20M. Another story is we had a marketing person who we caught lying. They had sent our partners confidential info about VMware to try to sell the company to them. We fired him, that was that. Anything can happen in a company when you start having more people involved — it’s amazing. When someone who is a leader isn’t being treated like a leader — this is another sign that this person might not be right. Question from the audience: What did you do differently with the new startup vs. VMware? Diane Greene: We are in such a different climate now. One radical thing we have done is — given it’s so hard to hire, and the traffic between SF and the South Bay is so intense — we made a decision to get two offices from day one. We have one office in Los Altos and one in San Francisco — and the whole team switches offices two days a week. This helped take a lot of friction out of hiring. Question from the audience: Can you share more about the early days of VMware? What were the intentions when you were first starting out? Diane Greene: VMware was actually my 3rd startup. My husband Mendel Rosenblum had invented the idea of virtualization and was working with some grad students. They put out a paper about their findings and all of these people from large companies were reading the paper and sent us notes about it. After this, we filed a patent on the idea and as the project got further along we thought we should take this market. We had a discussion with the grad students to see if they wanted to start the company with us and in the end they joined us. At the same time I was pregnant with our second child. My original plan was I was going to get the company going and bring in a CEO. Based on the lessons I had learned from previous startups, I had written down our mission, vision, and core values and everyone on the early team had to sign it to make sure we were all on the same page. I learned this lesson the hard way. Jerry Chen: Last piece of advice? Diane Greene: One thing I find problematic is I talk at a lot of schools and ask — how many people are going to start a company? And all of the students in the classroom raise their hand. The problem is, if everyone wants to start their own company — there won’t be anyone to hire. It’s wonderful to build something but I consider myself an entrepreneur even before I started a company. One of the main reasons why I started a company was there weren’t many good big tech companies to work for at that time. My advice is, if you have an idea and want to build something — to find the best environment for you to do that. It might be by starting your own company, or building it within an existing company. The more important things are — what you are building and who you are building it with. The official collection for Stanford’s CS183C: Technology-enabled Blitzscaling.